Bi-amplified design with 100 watts (60 LF, 40 HF) for powerful, accurate sound. When monitoring, it's important to sit in the middle position or 'sweet spot' where the stereo image is optimized. BX5 D3 features a pinhole power LED that makes finding the sweet spot easy. The tweeter is mounted in an integrated waveguide, which precisely focuses and directs the treble energy into the listening field, ensuring a solid and stable sonic image. The woven Kevlar low-frequency driver offers rich and articulate bass. The natural silk dome high-frequency driver uses a built-in waveguide to add clarity. This bi-amped design ensures that each driver is sent only the frequencies that it can reproduce most efficiently, producing clean power and plenty of headroom. 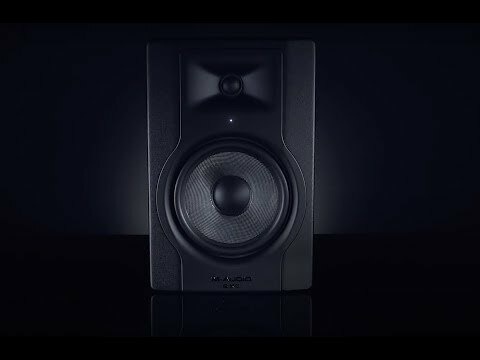 M-Audio BX5 D3 studio monitors are equipped with both XLR and TRS balanced/unbalanced 1/4" inputs, providing a solid connection to your studio mixer or other audio gear. The BX5 D3 Acoustic Space Control helps provide optimal acoustic conditions for tracking, mixing, and monitoring anywhere. Adapt the BX5 D3 to any mixing environment. Bi-amplified design with 100 watts (60 LF, 40 HF) for powerful, accurate sound. 5" Kevlar low-frequency driver with high-temp voice coil and damped rubber surround. 1" natural silk dome tweeter delivers superb transient details. New computer-optimized tweeter waveguide for precise imaging. Acoustic Space Control to fine-tune low-end response to your room. Optimized rear port for extended low-frequency response. XLR balanced and 1/4" balanced/unbalanced inputs for connecting audio interfaces, mixers, synthesizers, DJ gear and more. Ultra-wide range 52-35kHz frequency response covers full musical spectrum. Front panel LED shines brightly when speaker is positioned at ideal monitor angle. Buy M-Audio BX5 D3 in discounted set. Do you own M-Audio BX5 D3 or have you had a chance to try it? Nekem is ilyen monitorom van. Hangja jó, csak megfelelő akusztikával. Az acustic space kapcsoló keveset állít, jó lenne ha jobban lehet többet lehetne állítani. Több helyen is hasonló áron láttam, ami teljesen korrekt. Kezdő producereknek tudom ajánlani..
Ennyi pénzért ez egy jó hangfal. Elemző zenehallgatásra, házi zeneszerkesztésre teljesen megfelel. A kis mérethez képest hatalmas frekvenciatartomány, és gyönyörű hang. Ennyi pénzért abszolút megéri bedroom producereknek, vagy zenehallgatásra.